The major scale is the centerpiece of music theory and probably the most commonly used scale in music. In order to understand chord building, progressions, and other scales, you need to first understand the major scale. In this lesson we will take a look at what makes up the major scale and how to apply the major scale to the guitar fretboard. 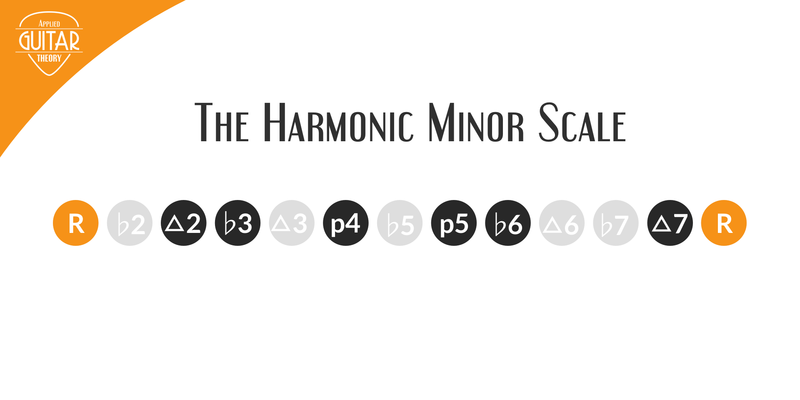 Before we get to the details of the major scale, let’s start with a basic understanding of what a music scale is. A scale in music is a group of notes ordered sequentially by pitch. Unlike chords where the notes are played together, the notes of a scale are played individually. They can be played ascending (increasing in pitch) or descending (decreasing in pitch). The scale formed by the group of notes is determined by the intervals, or distance, between each note of the scale and the number of notes in the scale. This pattern holds true for any major scale. 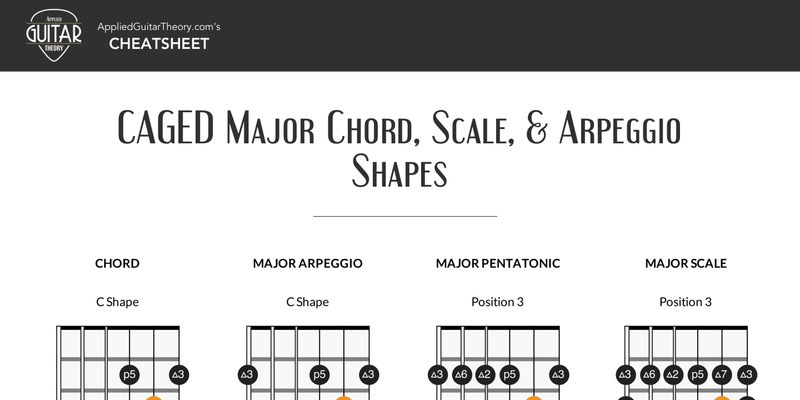 You can form a C major scale, D major scale, etc. all by using this same pattern. So now that you know what the major scale is, the qualities it has, and how you build it, let’s take a look at how it’s applied to the fretboard. You can think of the guitar fretboard as one big connected grid. Within this grid, you find patterns of notes. It stands to reason that if the notes on the fretboard follow a given pattern, so too do the scales that are derived from these notes. This is important to understand because once you learn to recognize the patterns that make up a given scale, it gives you the freedom to play across the entire fretboard. The examples here use what’s known as the CAGED guitar system to create the scale shapes. However, this isn’t the only system that’s used to create scale shapes on the fretboard. Another popular method is the 3 notes per string method. I don’t endorse either as being better than the other. I think that’s a personal preference and you should use what works best for you. You can find 3 notes per string examples in the resource section at the bottom of this lesson. 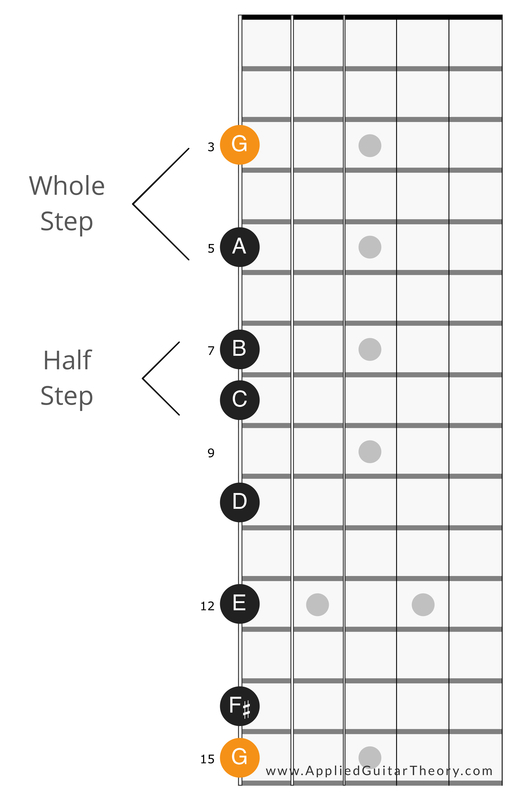 Starting with the G note on the 3rd fret of the 6th string, play each note of the scale in order across the fretboard (ascending) and back to the starting position (descending), including the F# on the 6th string. It’s a good idea when learning these scales to get into a habit of starting and ending on the root note, but be sure to play all notes of the pattern. Play these patterns the same as the first, up and down the scale starting and ending on the root, being sure to play all notes. Of importance to note is that these patterns are all connected to the position above and below by shared notes. The diagram below shows this relationship. Once you get to the last position (position 5), the patterns repeat themselves, starting again with the pattern of position 1. These scale patterns are movable. 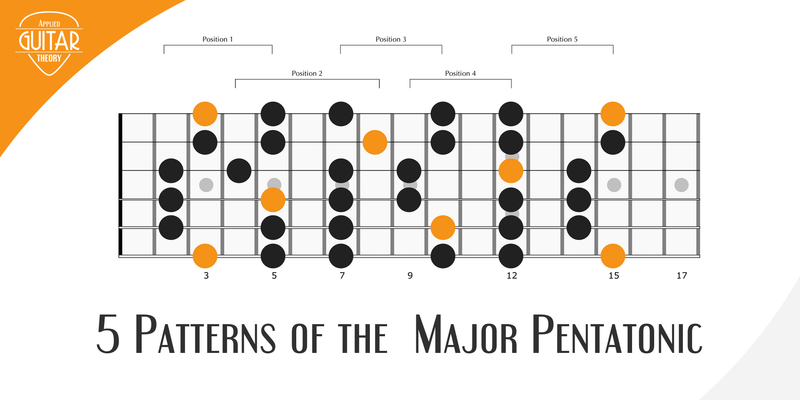 While these diagrams map out the G major scale, the patterns apply to all major scales. If you move these patterns up one fret, you’ll be playing the G# major scale. Move it up two frets and you would be playing the A major scale. You can shift the root note up or down the fretboard and play any major scale with the same pattern. To summarize, music scale is a group of notes arranged sequentially by pitch and played individually. The major scale is a diatonic scale consisting of 7 notes and and octave note. You build it by following a formula of half/whole step intervals (W-W-H-W-W-W-H). Since so many other musical concepts and theory are derived from it, the major scale is the most important scale for a guitarist to know. Learning it sets the foundation for your development as a guitarist.